SpaceShipTwo after its 2nd glide test. Chalkup another successful gliding test flight for SpaceShipTwo, VirginGalactic'scommercial spaceliner built to fly paying passengers on suborbitalthrillrides. Theprivately built suborbital spacecraft was released Wednesday (Nov. 17)from itsmothership ? the WhiteKnightTwo ? for the third time for a test flighthighabove the Mojave Air and Space Port in California. According toa test log posted by Scaled Composites ? builder of the WhiteKnightTwo/SpaceShipTwolaunch system ? a series of flight objectives wassuccessfully metfollowing clean release of the craft at altitude. "WatchingSpaceShipTwo going through its test points, circlingthe field and landing is thrilling indeed, especially due tothe sweepinggraceful planform of its wing and boom tails," Scaled's chieftechnical officer Burt Rutan, the veteran aerospace designer whofounded thecompany in 1982, said Thursday (Nov. 18). SpaceShipTwo,named the VSS Enterprise, is designed to carry six ticket-holdingpassengersand two pilots. The undertaking is backed by U.K. billionaire andadventurerRichard Branson for his spaceline, Virgin Galactic. Suborbitaltreks are selling at $200,000 a seat, with over 340 individuals signedup for flightsto the edge of space. For itslatest glide flight, SpaceShipTwo was flown to a more aggressive stallindication, with the vehicle maneuvered to a 3.5-G level. During theglide, the craft's stability and control were also evaluated. The spaceplanewas outfitted with a water ballast tank to establish an aft center ofgravity. This thirdshakeout of the SpaceShipTwo follows the Oct. 10 and Oct. 28 glideflights ?each pushing the vehicle to new levels of testing while enhancing pilotproficiency. SpaceShipTwobuilds on the success of Scaled's SpaceShipOne vehicle, a pilotedspacecraftthat won the $10 million Ansari X Prize in 2004 for reusable suborbitalspaceflight. 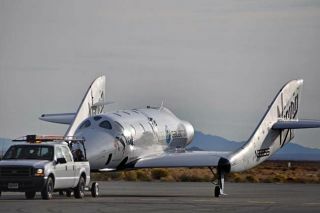 "Sinceit is a much bigger spaceship than SpaceShipOne, it gives a visualimpressionthat it is flying a lot slower than the small spaceship," Rutan toldSPACE.com. "Yesterday?s flight included opening up a much largerportionof the previous envelope, this time using water ballast to achieve anaftcenter of gravity. The ship dumped the water directly over the field,giving animpression that it was making thrust with the large plume." Rutan saidthe flying qualities of the vehicle continue to be reported asexcellent. "Congratulationsgo to Jim Tighe and his design team, who have done an excellent job onthe configurationand aerodynamic details," Rutan said. "It is not easy to achieve goodflying qualities on a large aircraft ? spacecraft ? that uses areversibleflight control system, and Jim did indeed achieve success, right out ofthebox." The pace ispicking up in assessing SpaceShipTwo as it heads for powered flightsusing itshybrid rocket engine. Meanwhile,earlier this month, ceremonies at the Mojave Air and Space Port markedthestart of construction of a new facility to build a fleetof SpaceShipTwos and WhiteKnightTwos for Virgin Galactic. On Nov. 9,The Spaceship Company (TSC) broke ground for its new final assembly,integration and test hangar. TSC is a newaerospace production company, a joint venture between Virgin Group andScaledComposites, a subsidiary of Northrop Grumman Corp.
Whencompleted, this new building will provide a 68,000-square-foot clearspan,737-size hangar that includes offices. It will serve as TSC?s operatingheadquarters and used primarily for the final assembly, integration andtestingof TSC?s vehicles before they enter service. The buildingis sized to support the production of two WhiteKnightTwos and at leasttwo SpaceShipTwosin parallel.